Add the olive oil, garlic, onion, zucchini and salt to a large pan and saute until the garlic and onions start to brown. Add the water, stewed tomatoes, chili flakes, soy sauce and penne and bring the mixture to a boil over high heat. 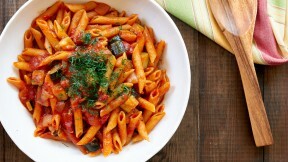 Turn down the heat to maintain a simmer and cook for 10-12 more minutes or until the penne is cooked to your liking. Adjust salt and pepper to taste and garnish with parsley.